Teens only become safe drivers by spending hours of time practicing in the car with a Certified Professional Driving Instructor. This package is for families who take their child’s driver training seriously and know that learning to drive is not a rite of passage, a game or an online app. The Advanced Pro package provides 37 hours of the utmost in professional driver training while satisfying all State parental driving requirements. Put your teen on the road with the utmost in driver training and confidence. The full SafeWay Advanced Pro program completes the full 37 hour State requirement while putting your young driver through 20 different driving environments on 10 planned tracks and 10 customized tracks that include both daytime and nighttime situations. Having VIP Driver Status has many advantages, including Priority Instructor Selection. We know that every teen learns differently and some respond better to different teaching styles. With the SafeWay Advanced Pro, your driver has the option to select their favorite Instructor. As part of our VIP Concierge service, this added benefit is only available to SafeWay Advanced training program drivers. When you enroll in the SafeWay Advanced Pro your teen will receive 37 SeatTime Hours which relieves you of all parental driving requirements. 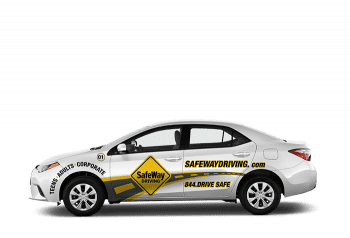 Only the SafeWay Advanced Pro can provide you with peace of mind that comes from knowing you are putting your teen on the road with the ultimate in driver training.